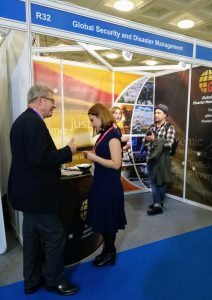 GSDM recently participated in the first International Disaster Response (IDR), combined with the established annual International Security (ISE) expo which took place in London 28-29 November. Law as an important under-utilised tool of disaster risk mitigation. It was an opportunity for GSDM to discuss and showcase the breadth and depth of its extensive security and disaster expertise and competencies. Many interesting conversations were had, including at the GSDM stand manned by Katja Samuel (Director, and a member of the IDR/ISE advisory council), Rebecca Benfield (Head of Business Development), together with three members of the GSDM associate team – Bahram Ghiassee, Olga Shashkina and Daniel Beech. Additionally, Katja made three presentations during parallel events taking place during the expo. 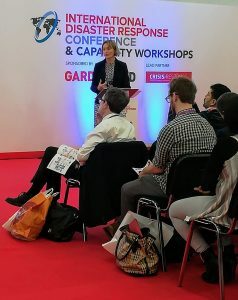 First of all, she contributed to the Security in Complex Environments Group (SCEG) symposium (https://www.sceguk.org.uk) alongside executive representatives of the private security industry. After outlining some of the core legal framework instruments around which industry compliance is framed, she explained how legal tools could also be used in more innovative ways as tools of risk mitigation and management, as well as identifying emerging legal and risk challenges posed by technological developments such as the increased utilisation of ‘dual use’ cyber surveillance tools, and drones. Katja also contributed to the IDR conference on the theme of ‘Law as an important under-utilised tool of disaster risk mitigation’. Framing her discussion around the Sendai Framework on Disaster Risk Reduction 2015-30, Katja explored some of its key themes, namely the need to develop more multi-dimensional, innovative approaches through the adoption of both traditional and novel multi-sectoral partnerships, the more dynamic use of available legal tools (spanning 20+ general and specialist legal regimes), and the development of better integrated multi-hazard approaches in order to address existing gaps and to reduce current levels of vulnerability. Katja then explored the potential benefits of these approaches through examples drawn from early warning systems (disaster communication, and international development), strengthening disaster risk governance, and na-tech scenarios (where a ‘natural’ disaster triggers a technological one). This discussion was further framed around due diligence obligations to protect populations, prevent harm (including transboundary environmental harm), and to ensure the availability of appropriate reparations for victims (individuals and states) following any breach. Furthermore, Katja was able to contribute to the IDR capability workshop, demonstrating the breadth of GSDM’s expertise across global security (illustrated by counter-terrorism in armed conflict and law enforcement scenarios, discussing too challenges posed by surveillance and dual use technology); disaster risk management (illustrated by a na-tech scenario resulting in CBRN contamination, remembering too the plight of victims who often struggle to obtain adequate reparation and compensation for loss of life, homes, livelihood and so forth, including where poor governance is a contributory factor); and where the security and disaster paradigms intersect (illustrated by approaching a terrorist attack against a critical national infrastructure through the prism of a catastrophic disaster). GSDM is pleased to assist prospective clients and partners on these and many other security and disaster related issues. For further information, please contact either Katja Samuel (director@gsdm.global) or Rebecca Benfield (rbenfield@gsdm.global).